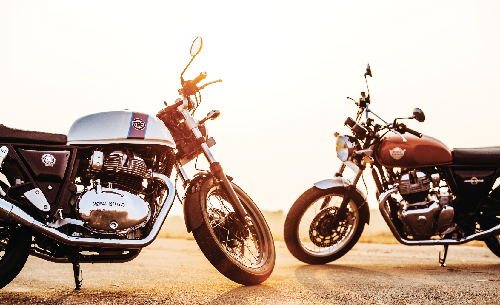 Royal Enfield, the Eicher Motors-owned cruiser and touring bike specialist, is going global with its brand new 650 Twins motorcycles after dominating the growing Indian market for close to two decades. The popular brand introduced the much-awaited Continental GT 650 and Interceptor 650 motorcycles amidst much fanfare in Goa in mid-November 2018. But the good news for the bike enthusiasts was the brand’s strategy to come out with a killing price tag for the new 650cc Twins. Prices for the base Interceptor 650 start at Rs 2,50,000, while the base Continental GT 650 carries a price tag of Rs 2,65,000. While the Interceptor 650 Custom retails for Rs 2,57,500, the Continental GT 650 Custom retails for Rs 2,72,500. The Interceptor 650 Chrome has been priced at Rs 2,70,000, while the Continental GT 650 Chrome is the most expensive of the lot, at Rs 2,85,000. Undoubtedly, the 650 twins are the most powerful motorcycles in Royal Enfield’s portfolio and sport the brand’s first modern twin-cylinder engine. While both the motorcycles share similar underpinnings, they adopt distinctive body styles to lure buyers. In India, the highly price conscious market the above 500cc motorcycles are very expensive and are normally imported from overseas factories or at best assembled in the country. With the brand’s aggressive pricing of the Royal Enfield 650 twins, they do not face any direct rivals as of now as they are priced between the single-cylinder KTM 390 Duke and the recently-localised Kawasaki Ninja 300. The closest rival to Royal Enfield’s new twins with respect to being a mid-displacement twin-cylinder bike is the Harley-Davidson Street 750, which retails at Rs 5,31,000 in the country. “With our brand new Royal Enfield 650 Twins, for us it is not only Indian market but expanding the global foot print,” Siddhartha Lal, chief executive at Eicher Motors, which owns Royal Enfield told Financial Chronicle. Royal Enfield, he said aims to lead and expand the mid-weight (250-750cc) motorcycle segment globally. The Royal Enfield Interceptor INT 650 and Continental GT 650 will help grow this segment, he pointed out. “While for our large customer base in India, the new 650 twins will be a compelling upgrade, we believe it will attract customers from other developing markets in South East Asia and Latin America to graduate to the middleweight segment,” Lal said. In addition, the 650 twins will offer a very evocative option to customers in mature motorcycle markets such as Europe, Australia and North America, he said. “For us, this marks the beginning of a new chapter at Royal Enfield,” Lal boasted. He said undoubtedly, the Interceptor 650 carries forward the Royal Enfield legacy into the 21st century. While in its essence it retains the design and old-school character, it has all the underpinnings of a modern machine. It combines agility, usable power, excellent ergonomics and style in an unintimidating manner. However, the Interceptor 650 is more than the sum of its parts – it is great fun to ride and brings a smile on your face every single time that you ride it. He said the brand is already present in markets outside India and it knew what bike enthusiasts wanted. “The customers overseas love the modern classic concept of Royal Enfield products but with a bit more power, refinement and highway worthy, Lal explained. “We have been gathering a team of professionals who have done this kind of work over the last four or five years since in India we have not done this kind of work,” he said. Thus, the brand’s technology centre in UK now has 140 engineers and designers compared with just none about five years ago. Lal said the 650 Twins bike was a collaborative project between the global team sitting in UK and its technology centre in Chennai and the end results as conceived is a global twin products. Significantly, the company has discovered a huge vacant market in the mid-size modern classic type of motorcycles and most of the European and American motorcycles manufacturers have moved to bigger motorcycles since they prefer to make low volume and earn high margins. “On the contrary, we are going after scale of operation. Thus, the market there usually starts at 850cc bike but we are coming at a notch below at 650cc bike range but it has similar attributes to lure customers,” Lal explained. Thus, significantly, the brand has a home market India which is huge in terms of scale and it gives the brand the right cost structure and the company has also priced the bikes to get the scale. And with lower cost structures it is also going to crack the international markets with competitive price tags. “Our customers in UK, US and Europe are already delighted with our prices in these countries,” Lal said, adding that the company has expanded its distribution network to establish the brand on firm footing. “We have a long term strategy and we want to make a mark globally,” Lal said. The aim clearly is to expand the mid-size motorcycle segment globally with new product launches in the future.